Before writing this I looked back on some of my posts and see that without realising I have used “Winnie the Pooh” isms….””And Now we are 8” I wrote a couple of months ago, unaware that this could easily be something from Pooh. 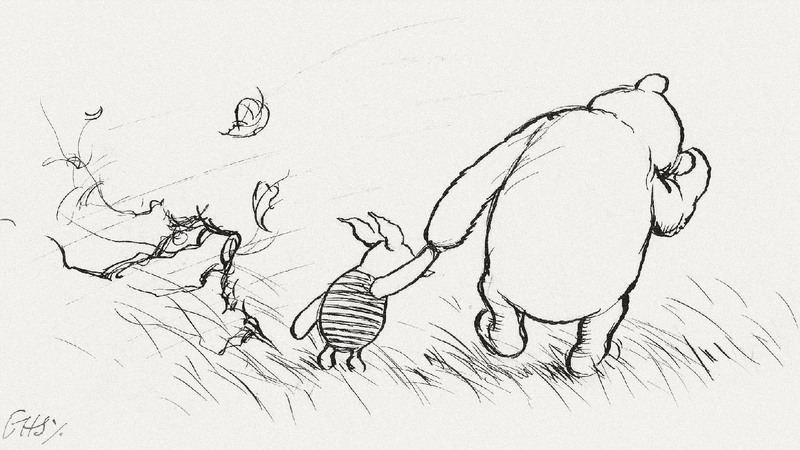 I’ve always loved Winnie the Pooh books and stories, but not for their writing, or the narrative, as much as the illustrations of E.H Shepard. As such I felt Disney had previously ruined the atmosphere and character that Shepard had in his drawings. If it’s possible they seemed to dumb things down by painting everything in bright neon colours. Any animation work they did around these books just didn’t sit right for me. What I also loved about the illustrations was how they capture movement. They remind me of an animators frames; quick lines that look more like a storyboard than fully completed illustrations. Of course some were more complete, and inked in, but the example above is the style I love and the kind of illustration that drew me in. As a result of this when I went to see the new Christopher Robin film this weekend I approached it with some trepidation of what Disney might do…again. This isn’t a review of the film, (it’s good, but with flaws. My 10 year old adored it and that’s what matters) but I was pleasantly surprised to find that they managed to keep the charm, and even more importantly for me had managed to animate these drawings as a device within the film that also captured the movement within the illustrations. I think E.H Shepard would have been happy with the result.